South Africa is a wonderfully diverse holiday destination with something for everyone including spectacular scenery, fantastic wildlife, a range of holiday accommodation, rich culture and history and modern cities. South Africa has over 21 National Parks, eight World Heritage Sites, 3,500 kilometres of pristine coastline, an extraordinary climate and amazing activities from shark-diving to surfing, historic trails to wine tasting. There is plenty to do and see in South Africa on holiday. Holiday accommodation ranges from Luxury lodges and self catering to Hotels. For anyone fascinated by wildlife, a African safari is a must do in South Africa. You can encounter the famous Big 5 up close, the buffalo, elephant, lion, leopard and rhino. For the Big 5 safari experience in South Africa, many provinces in South Africa offer this, however the Kruger National Park and Limpopo are the most popular. Kruger National Park is one of the largest game reserves in Africa and home to a large number of species. A must see in South Africa is the The Garden Route, a stretch of the south-eastern coast. The Garden Route road is extremely scenic, however the hidden destinations on its side roads are also the main reason to visit this stretch of coastline, such as Oudtshoorn, Sedgefield, The Wilderness, Knysna and Plettenberg Bay. Along the coastline there are secluded little bays ideal for relaxing and enjoying the Ocean. There are also modern golf courses and modern malls. 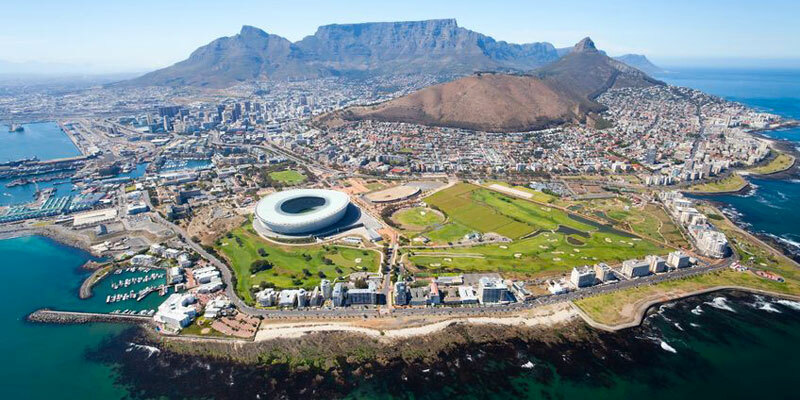 Cape Town is South Africa's most scenic, romantic and most visited city, set along the mountainous Cape Peninsula spine. Its most famous sight and attraction is Table Mountain. With over 550 well-established paths, the mountain is ideal for hikers, climbers and amblers. For the less energetic, there is the Table Mountain Aerial Cableway to get you to the top and back. Cape Town’s stunning beaches along the coast are family friendly and offer a variety of water activities. The Harbour offers plenty of restaurants, bars and cafes, and lots of shops. Elephant sanctuary: look, touch, ride! Monkeyland is a primate sanctuary with experienced game-ranger guided safaris. Numerous species of monkeys.